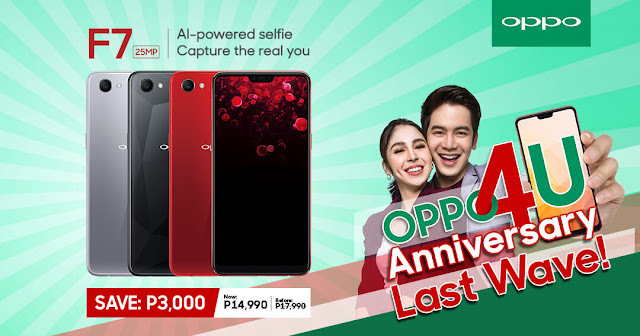 Home / android / f7 / oppo / smartphone / Sale Alert: OPPO F7 now available at PHP 14,990. Sale Alert: OPPO F7 now available at PHP 14,990. On its 4th year anniversary in the Philippines, OPPO is delighting all customers with the last wave of the OPPO4U Anniversary Sale. The highly competitive and well-received OPPO F7 is now made more affordable at PHP 14,990, giving customers PHP 3,000 in savings. Consumers may visit all authorized OPPO stores nationwide and online shopping partners such as Lazada, Shopee, Argomall, Akulaku to avail of the latest offerings of OPPO. Additionally, the F7 is also available via Home Credit at six or nine months with 0% interest financing.